Cab has steel roof, acoustical headliner, front windshield glass, electric wiper. Cab is not ROPS certified, but sits in front of the existing, un-modified factory ROPS. This cab is available with a choice of cowl, rear window and side panel configurations. Your cab can be custom configured below with these and other optional accessories. 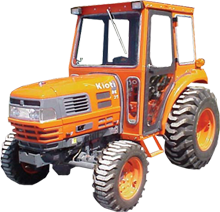 Special Fit-up Notes: This cab will fit bare tractors or tractors with a KL1450 factory loader or Woods 1012 loader - Must select option 1001-1608S for correct loader cowl configuration. Cab height is approximately 58.75 inches high, measured from the platform floor.